Please refer back to previous post for all about #ECGclass and case scenarios. A 60yr old gentleman comes to see you with a persistently raised clinic blood pressure of 158/98 mmHg. You arrange Ambulatory BP monitoring (ABPM) which reveals a mean BP of 148/94 mmHg. In accordance with the current NICE guidelines, you arrange bloods, urinalysis and ECG in order to assess any target organ damage. Cardiovascular examination is normal other than you notice a slight irregularity in his pulse. His bloods for FBC, TFT, U&E's, eGFR, glucose and lipid screen are all normal. You calculate his 10yr cardiovascular risk to be 18%. His ECG trace is seen below. He denies any chest pains, dizziness or palpitations. In fact, he feels completely well. Q1 What does this ECG show? Can you see P waves? Are they all morphologically the same? - study the rhythm strip, and look carefully in front of every QRS (You may need to zoom). 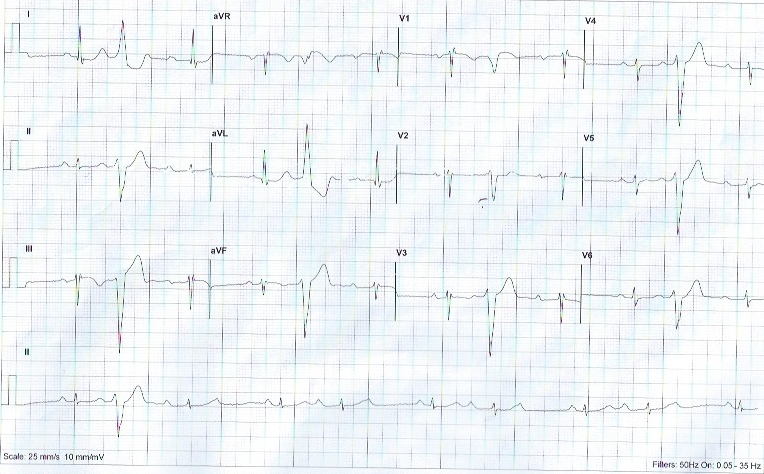 First identify and exclude the T waves, then study how many other P-like wave forms you can see. Is the PR interval normal and consistent? Yes P waves can be seen, but they vary in morphology/size. In this ECG, every other beat features a P-wave that is slightly different from the preceding one. The normal sinus focus appears, as a classical rounded P wave, followed by a QRS of normal morphology. The next QRS (again normal morphology) is preceded by a smaller 'blip' of a P wave. This smaller P wave occurs prematurely, and because of its different appearance, we know it originates from some other focus or foci. The PR interval is normal and consistent. Measure it! Regardless of whether you measure from the normal P-wave, or from the PAC, the PR interval is consistent. It measures about 3.5 small squares. (normal = 3-5 small squares). The Rhythm is Regularly irregular. When a PAC follows every sinus beat, the rhythm is known as Atrial bigeminy. 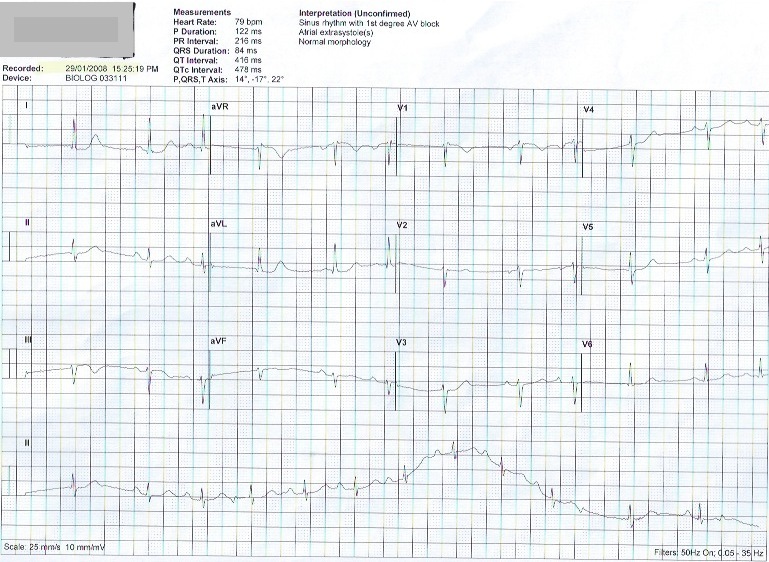 If a PAC follows every third beat, then it is known as Atrial trigeminy. All of these rhythms are regularly irregular. This ECG shows Atrial Bigeminy. Since the focus originates in a different part of the atria, Atrial ectopics will have a different P wave morphology. They will still have a PQRST waveform, but it will occur prematurely. The premature beat will be followed by a compensatory pause (ie. the ectopic beat doesn't reset the sino-atrial node, and the underlying sinus rhythm continues undisturbed). Unlike ventricular ectopics, as seen in the last case (#ECGclass Case 21), Atrial ectopic beats are followed by a normal rapid conduction through the ventricles. The QRS complex is therefore narrow and of normal morphology. Ventricular ectopics, and so ventricular bigeminy, originate from an abnormal focus within the ventricle wall. Conduction through the ventricle is not rapid via the Bundle of His, and is therefore slowed down giving a wide QRS complex. Atrial Bigeminy is a harmless, benign rhythm. It is frequently an incidental finding and is usually asymptomatic. No further cardiac investigations are indicated as most people with this rhythm do not have organic heart disease (although in those with heart disease, it seen). It's worth asking about fatigue, smoking, alcohol use, emotional stress and caffeine intake, as these lifestyle factors have been linked to the occurrence of Atrial ectopic activity. Q2. Are you going to offer antihypertensive medication? 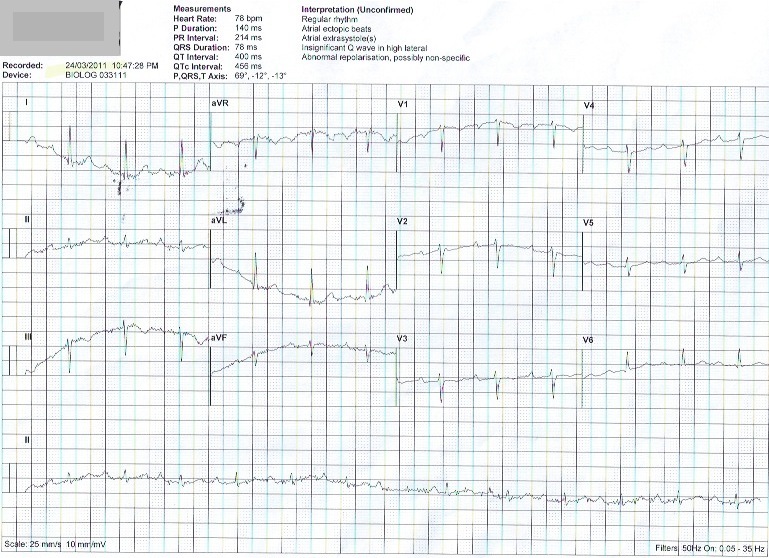 In the clinical scenario given, this ECG diagnosis is an incidental finding and can safely be ignored. But remember, why did you do the ECG? Does the ECG show any LVH? In accordance with the Care Management Pathway of NICE CG127 Guidelines (see page 6), with an ABPM of 148/94 and no evidence of target organ damage (normal bloods, no proteinuria, no LVH) and a 10yr CVD risk of <20%, he has Stage 1 Hypertension, and doesn't need antihypertensive medication. He should be given lifestyle advice and offered an annual BP review. The atrial bigeminy is an innocent, incidental, ECG finding. Ignore. Q1. What does the ECG show? Are they consistent in morphology? Is the PR interval consistent and normal? Q2. i) Does this ECG show LVH ii) Are you going to offer BP medication? It's the first day back in surgery, after New Year bank holiday, and a 56yrs lady presents in morning surgery with 'palpitations'. She's noticed then for the past 2 weeks. Q1. What other factors in her history might you want to elicit? She tells you they come on at the end of the day. Last 1-3 minutes and feel like an intermittent irregular "thud. She has never smoked, but has partied 'quite hard' over the Christmas week! She hasn't noticed any particular triggers for the symptoms, but they are worrying her. She knows her father had an 'irregular heart problem' before he died, but she doesn't know what it was. She is not taking any medication, is post-menopausal, and has always been fit and well in the past. Q2. What investigations might you consider? Examination is normal, but you can feel an occasional 'dropped beat' on palpating her pulse. You decide you would like FBC and TFTs and book her in for them next day, with an ECG. Q3. What are your thoughts on the ECG obtained below? Palpitations are a very common presentation in General practice. They represent an 'awareness' of heart beat. They may be entirely benign, or represent a variety of conditions. Individuals 'awareness' of a normal heart beat is very variable. People can report an awareness of palpitations during normal rhythm, a fast sinus rhythm or abnormal rhythm. Others with significant or frequent ectopic beats may surprisingly unaware. Palpitations are often associated with anxiety. These more often than not occur at rest, often whilst waiting to go off to sleep, when the anxious mind is not distracted by other things. Palpitations which occur only on exercise/activity merit further investigation. Social - Consumption of Caffeine, Alcohol, Nicotine, Usage of prescribed and non-prescribed drugs. Bloods - FBC (?anaemia), Electrolytes and Thyroid function. The ECG above shows Ventricular Bigeminy. In other words, each normal sinus beat (P-QRS complex) alternates with a Ventricular Ectopic beat. This may well be entirely benign, and depending on the history obtained, may just require reassurance, and review after any lifestyle modifications which can be made. If there is any doubt about symptom triggers, then a 24hr ECG may be useful. Keep reading for more about the different types of Ventricular Ectopics, and their significance, on the next post! Mobitz Type I / Wenckebach. (Second degree Heart Block). Welcome back to ECG Class and Happy New Year to everyone! I hope you are all well rested and ready for another term. ECG interpretation is often open to debate, and will usually evolve as new information becomes available. Everyone's opinion is valid, and useful for others, as this evolution process takes place and we form an interpretation together. I'm throwing you in the deep end a bit tonight, no New Year gradual warm up! So don't be disheartened. It may look daunting at first glance, but bear with me, and you'll be surprised how easy it is to get on the right track, once you break the ECG down methodically! It's Friday Morning and you are the duty GP. The CHD nurse has just done a 'routine' annual CHD review on a well 81yr old lady. As a matter of routine, she has done an ECG, and wanted to check you are happy with it before she lets the lady go home. She puts the ECG below on your desk. Q1 Is there any thing else you'd like to know? Before making any decisions, or reviewing the lady, you decide to look back through her electronic notes. You see that she also had routine ECG's done 1 year ago, and 3 yrs ago. Q2 You now feel in a position to go an see the lady. What things might you want to know from her? You go to see the patient. She looks clinically well. She denies any symptoms including chest pain, shortness of breath, palpitations, dizzy spells or blackouts. Examination is completely normal, other than an irregular pulse. For her well controlled IHD, she takes Amlodipine, but is not on a beta-blocker, nor is she on an other rate limiting medication. She does take Losartan, but has never tolerated aspirin or statins well so she chooses not to take these. For her age, she enjoys a good quality of life, and is very independent. She thinks you are fussing by coming to see her and just wants to go home. Lets concentrate on the presenting (first) ECG above. Q3 Is it regular, or irregular? Can you see P waves? Lets look at ECG1 to start with. Sometimes it can be difficult to know which waveform is the P wave and which is a T wave! Often the easiest way to establish this is to pick any lead with a nice clear P-QRS complex and look out for matching morphology in other leads. In ECG 1 we can see that the very first complex in leads I, II and II, appears to be a normal P-QRS complex, with a larger T wave following. The T wave is closely followed by a ventricular ectopic beat. So, concentrating on the Rhythm strip (Lead II), we can recognise several P waves which match that morphology seen in the first waveform: a small rounded, subtly peaked, dome. If you map out the P waves of a separate piece of paper, they are in fact regular. This may not appear so at first, but where you might expect one to fall, the complex seen is distorted by the hidden P-wave. Each of the last 4 QRS complexes are preceded by a P wave. Map them out. The wave form which follows the penultimate QRS is distorted by a 'hidden' P wave. But what about the P-R interval? Those astute ones amongst you might have already noticed that this is inconsistent. The P-R interval in lengthening. Look at the 3rd QRS complex on the lead II rhythm strip. (Don't count the Ventricular ectopic beat between the 1st and 2nd normal QRS complexes). This 3rd complex has a P-R interval just to say within normal limits (3-5 small squares). The 4th complex has a much more prolonged PR interval of about 8 small squares. The 5th complex has a PR interval the same as the 3rd, BUT - note that the RR interval between the 4th and 5th QRS complexes has lengthened....This should make you suspicious of a missing QRS complex. (If this occurred post-ectopic beat, you might put it down to a compensatory pause, but this doesn't apply here). The whole cycle then restarts with a normal PR interval in the 5th complex. This is typical of Wenckebach (or Mobitz type1) SECOND degree heart block. The R-R interval progressively shortens (This is not seen in the ECG above as the Wenckebach cycle repeats after only three P waves. You would need a longer Wenckebach cycle to see this shortening of the R-R interval). So Her presenting ECG today, shows second degree heart block with ventricular ectopics thrown in just to make analysis more tricky on the eye. Don't let the ectopics beat you ( :) sorry! ). When faced with multiple ectopics, always try and find a section on any ECG which has a run of complexes unaffected by the ectopics. It helps! 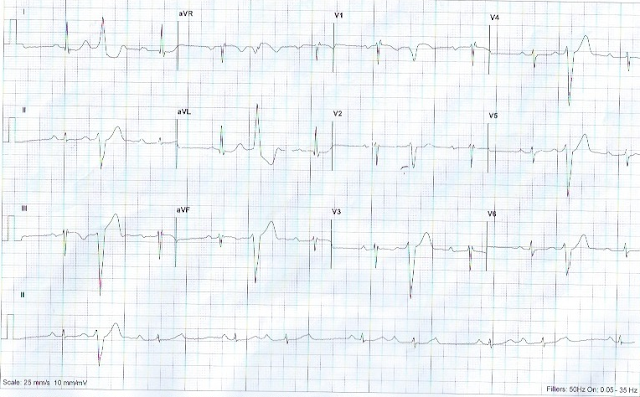 You might have been forgiven, on this ECG, for thinking there was a mixture of Ventricular and Atrial ectopic beats (having noticed some QRS complexes without a preceding P wave). This demonstrates the importance of mapping out the P waves, and measuring the consistency of, or variation in, the P-R interval. This lady is 81yrs old. She's well. She's asymtomatic. Is Mobitz Type I, Second degree heart block a benign condition? Mobitz Type I has always tended to be regarded as benign, especially in young otherwise healthy individuals. However, even in the young, there is some evolving evidence that daytime Wenckebach (as opposed to purely nocturnal Wenckebach) may not be so innocent. For this reason, more and more cardiologists would often advocate a 24hr tape. For all patients it is wise to review their medications. In this 81yrs lady, the Wenckebach is possibly more significant. Looking back at her old ECG's I think we can see the block slowly evolving. 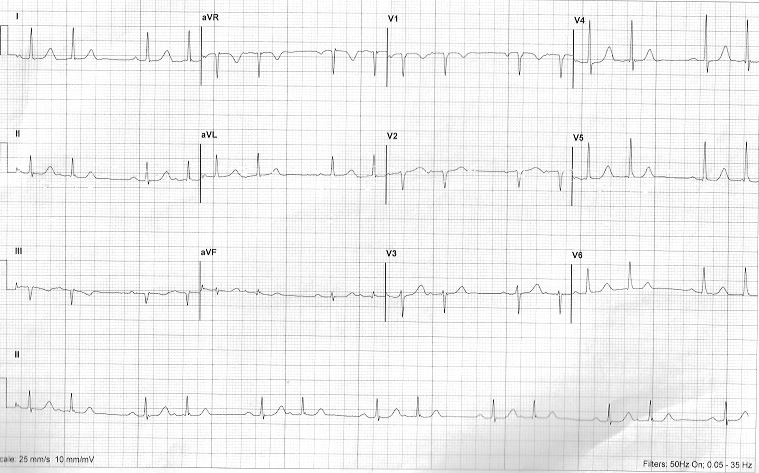 In ECG 3 (taken 3 yrs ago) it is interesting that the computer analysis reports at 1st degree AV block. I think this is dubious, but certainly borderline. 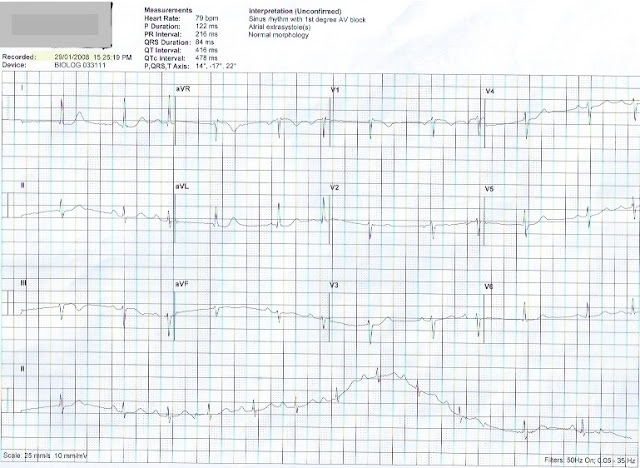 There are a few atrial ectopics there as well, but for a routine ECG, in an asymptomatic patient, it is quite appropriate that this ECG was filed without action. In ECG 2 (taken 12months ago) the computer makes nothing of the PR interval, but even with the poor quality baseline, I think we can see that the PR interval is consistent but prolonged, in keeping with 1st degree Heart Block. Again, at this stage, in a well patient, the only action necessary may be a medication review to make sure she is not on any rate-limiting medication. An alert on her electronic records may be wise, to remind clinicians not to initiate beta-blockers, or rate-limiting calcium channel blockers. In conjunction with the new onset of ventricular ectopics, this lady's new onset Wenckebach may represent serious underlying conductive tissue disease. Medication review : any beta-blockers should be stopped. Other medications such as Digoxin/Tricyclics should be reviewed and considered. Refer for a 24hr ECG tape - with advice NOT to drive until reviewed with results. Thank you, once again, for joining in. Q1 Is there any other information you want? Is Mobitz Type I, Second degree heart block benign?